Artists have been inspired by the landscapes of Le Marche for centuries, from Piero della Francesca and Raphael to Perugino, Bramante and many others: all have left traces of their genius throughout the region. During the Renaissance especially, many major artists either were born or spent time in Le Marche, which today is graced with some of their masterpieces. Read on for a Marche itinerary in their footsteps. Let’s start with Piero della Francesca, a painter whose use of perspective was a major contribution to the Italian Renaissance. Begin exploring his traces in Urbino, an enlightened center of the Renaissance, thanks to the patronage of Federico da Montefeltro, the duke of Urbino from 1444 to 1482. The National Gallery of Le Marche, housed inside the magnificent Ducal Palace, features two of Piero della Francesca’s masterpieces: the Flagellation of Christ (c. 1444-1470) and the Madonna di Senigallia (c. 1470-1485). The Val Metauro, a valley that extends from the Apennine mountains to the sea, with rolling hills dotted with vineyards, olive trees and historic villages, and the Montefeltro, comprised between the provinces of Pesaro and Urbino in Le Marche and the province of Rimini in Emilia-Romagna, often constituted the background for Piero della Francesca’s paintings. 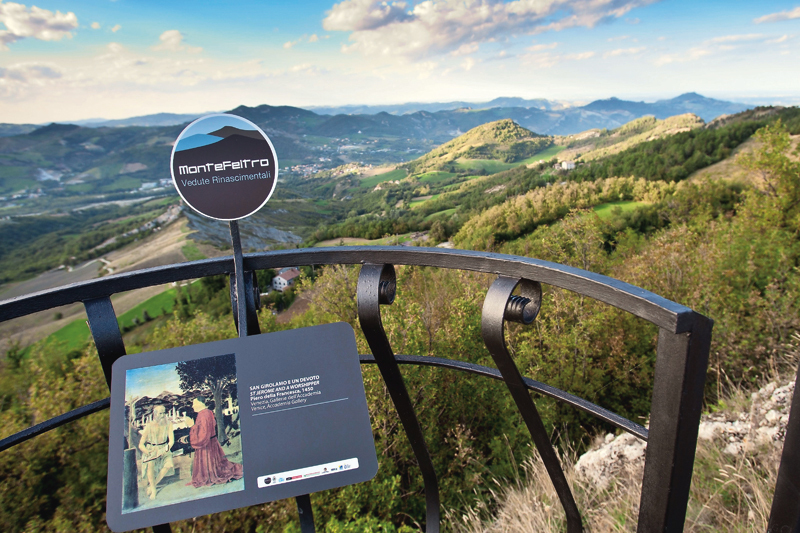 Thanks to the project “Montefeltro – Vedute Rinascimentali” (Montefeltro - Renaissance Views), visitors can now observe the real landscapes that inspired the artist while comparing them to how they are represented in his works. A few years ago, two art historians identified seven specific landscapes, and set up observation points equipped with special balcony-stations that feature a reproduction of the painting depicting that particular landscape. Such is the case with the Balcony Ca’ Mocetto (Urbania), where one can see the background to one of Piero della Francesca’s most famous portraits, the Diptych of Federico da Montefeltro and Battista Sforza (dated to about 1465 to 1472; the original is in the Uffizi Gallery in Florence). The landscape depicted here is the plain of the Metauro river, between Urbania, Peglio and Sant’Angelo in Vado; in the distance, one can see the Apennines, with the massifs of Monte Trabaria, Sasso Simone and Simoncello, Carpegna. The river winds through cultivated fields and rows of trees until it turns into a small lake. On the left is the hunting estate of the Montefeltro lords, the Barco Ducale. A Marche native, Raphael (1483-1520), master painter and architect of the Italian High Renaissance, was born and grew up in Urbino, at a time when the city was a major cultural center, under the patronage of the learned and refined court of the Montefeltro, where artists of the caliber of Luciano Laurana, Francesco Di Giorgio Martini and Piero della Francesca worked in the second half of the 15th century. 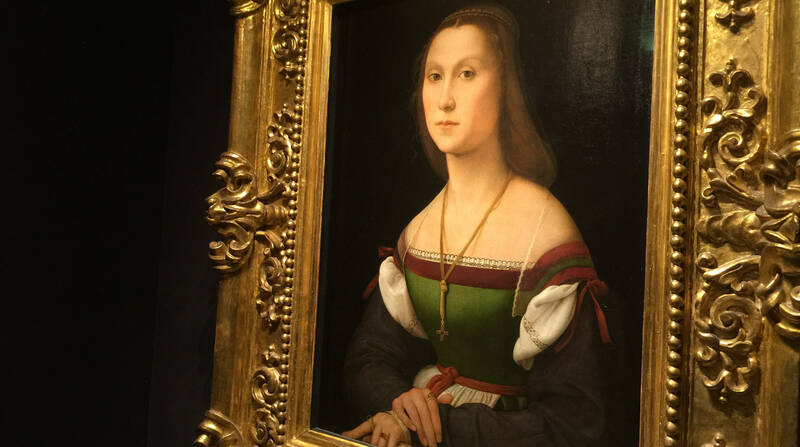 The National Gallery of Le Marche (cited above) also contains two works by Raphael, including the Portrait of a Young Woman, also known as La Muta (the mute woman). In Urbino, you can also visit Casa Raffaello, the house where Raphael was born, which today is the seat of the Raphael Academy. Raphael was a pupil of Perugino (1450-1523), another major artist of the Italian Renaissance (the author behind the Delivery of the Keys fresco for the Sistine Chapel in Rome). Perugino in turn was influenced by the works of Piero della Francesca. In Le Marche, visitors can admire two of his works, the Annunciation, in the Church of Santa Maria Nuova in Fano, along the Adriatic coast, and the Pala di Senigallia in the Church of Santa Maria delle Grazie, in the coastal town of Senigallia. Donato Bramante (1444-1514), who was born in Fermignano, in the province of Pesaro/Urbino, became a major architect of the Renaissance. The artist behind the design of Saint Peter’s Basilica in Rome, Bramante trained in Urbino and returned to Le Marche when Pope Julius II commissioned him the design of the Basilica della Santa Casa di Loreto. Bramante planned the façade (not completed), the square in front and the adjacent Apostolic Palace, as well as the grand marble screen around the Holy House, which today is the shrine's main attraction, and a Catholic pilgrimage destination since at least the 14th century.